Read an article few days ago on Business Times that say prospects is better for O&M firms with International Exposure. 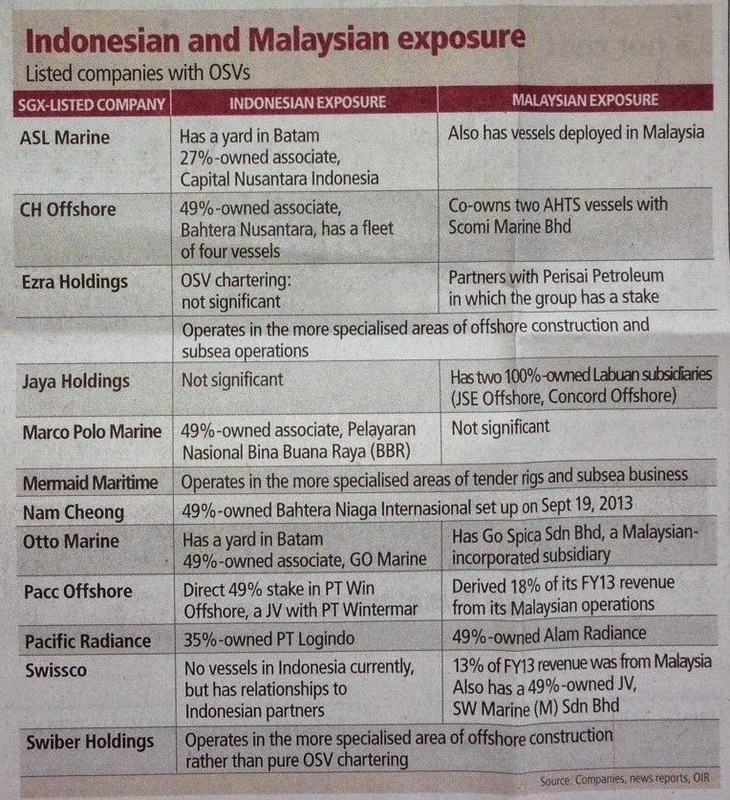 The article trigger me to write this blog summarizing outlook of the Singapore Offshore & Marine companies. International Oil companies (IOC) are oil super majors such as Exxon Mobil, Shell, Conoco Philips, Chevron, BP, Total etc. Since the turn of the millennium, IOC Capex has grown 348% due to the increase energy demand particularly in Asia Pacific. However oil production is up much less, resulting in less than anticipated profits for IOCs. 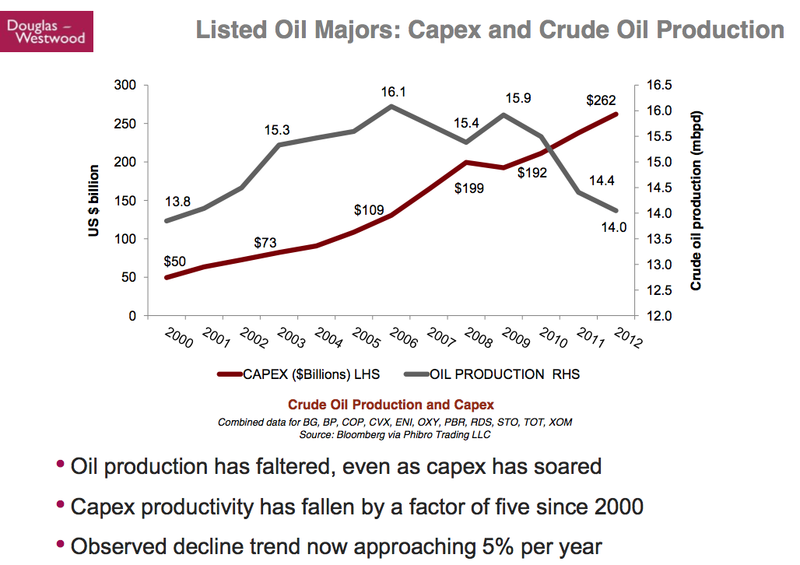 Below is an extract from Douglas Westwood showing the inverse relationship of Capex and Oil production since 2009. Since most of the world’s oil reserves are state owned, IOC has to focus growing production in more and more difficult areas, which resulted in soaring well cost. Primarily reasons of cost increase includes increasing technical challenges, over engineering, project management issues, shortages of skilled labor, and local content pressures. It is expected that Capex will reduce to mid-single growth for next 4-5 years, but it will not collapse. The long term outlook still remains good, just that the industry has to be more capital efficient. What it means for Rig builders with a tighter IOC Capex. With a tighter Capex, orders for newbuild Rigs may be affected. However the increase technical challenges in exploration and production may also mean older Rigs may be rendered unsuitable for new operations. Many international Rig owners have fleet with average age profile over 20 years, that may call for replacement or refurbishment. For instance Diamond Offshore's average floater unit age is slightly under 30 years and Transocean's average age is over 20 years. The reduction in IOC Capex may seem to adversely affect the newbuild Rig orders for the likes of Keppel and Sembcorp Marine, but it may well offset by the replacement of old and obsolete Rigs. National oil companies (NOC) own about 80% of the world's proven oil reserves. With a sustained high oil price of USD100/bbl, NOC are keen to sustain spending. 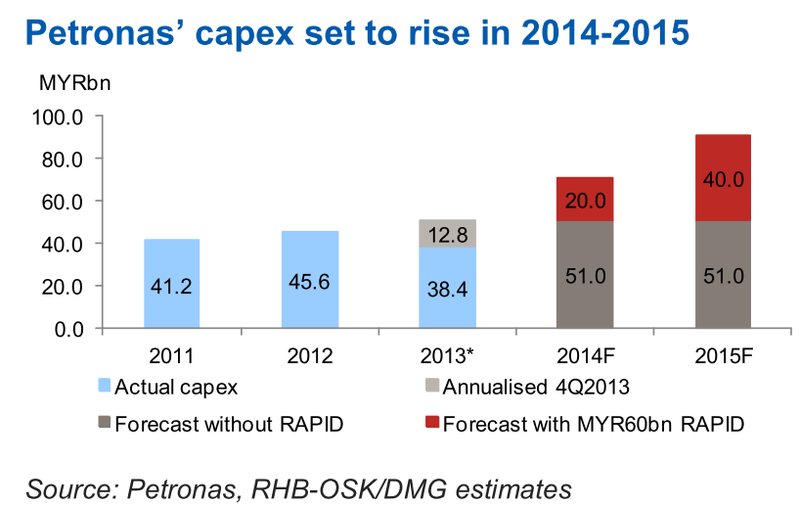 E&P capex spending expected to grow 6-7% globally in 2014, is anticipated to rise 15% in Asean, mainly driven by Malaysia Petronas and Indonesia Pertamina. The increase in Capex from our neighboring countries is likely to have a positively effect to Singapore offshore and marine companies such as Nam Cheong, Pacific Radiance etc who satisfy the local cabotage laws - will discuss cabotage laws in the next section. Mexico's state-owned Pemex plans to spend record of $28 billion in 2014. Already Pemex had JV with Keppel last year to develop, own and operate a yard facility in Mexico, the first phase of which is to support the construction of six KFELS B class jackup drilling rigs. Swiber has established foothold in Latin America through its very own Swiber Mexico offices. Just this week, it also benefited from a US$80m EPIC contract in Latin America for subsea development work including pipeline tie-in work. While Brazil's Petrobras is taking a pause in spending (-2%) in 2014 to improve its financials, it has reported a $236.7 billion budget over its 2013-17 business plan, with 62.3% allocated to E&P. Petrobras production from Pre-salt wells where oil reserves are found in deep-sea areas will benefit companies in Deepwater subsea market. Exploration and Production expenditure in the Middle East led by Kuwait and Saudi could also increase by more than 14%. Ezion and Swissco (via recently acquired Scott & English) good track records in Middle East and Mexico should benefit with more orders in the pipeline. Vallianz recent JV with Rawabi in Saudi should also take advantage of the situation. Jack up market remain strong as oil companies still require short to medium term production for cash flows, where utilization rates are above 98%. So far in 2013, about 60 jackup orders were placed, the highest since 1980. The large number of orders clearly demonstrated the strength of the shallow-water rig market and further confirms that we are in the middle of a rig construction boom. The strong rig demand will make Keppel and Sembcorp Marine attractive investments in the short to medium term. While many believe that the new rig additions will be well absorbed by the market due to new units substituting older rigs, I am particular concern about the digestion of the incoming huge supply which may affect future charter rates. Moreover 31 out of the 119 jackups under construction were from speculators and asset players, and not true rig drilling contractors. Be aware that any twist of fate will sink the speculators. Marco Polo, Falcon Energy, Viking Offshore etc are among some of the speculators listed in SGX. The strength of the rig building with huge backlog orders underlines optimism for OSV demand. Outlook is bright as (1) orderbook-to-fleet ratio declines (2) charter rates show signs of improving, and (3) utilisation rates are higher. 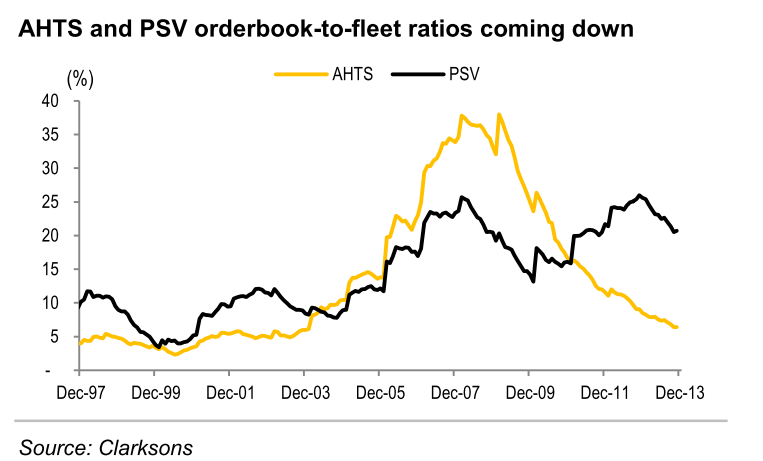 Ever since the crisis, OSV order book has tapered off and now stands at a healthy level of 12% of the global OSV fleet. A healthy Rig to OSV ratio is 3.8 to 4.0. Currently the OSV/rig ratio appears to be 4.8, which is an oversupply condition. This may be misleading as we need to consider the age profile of the current fleet which are mostly over 25 years old and non-competitive tonnage. Assuming that i) all active rigs will remain in operation for the next two years; ii) all modern OSVs will remain in operation for the next two years; iii) all new rig and OSV tonnage will be employed, the modern OSV/Active rig ratio including order books – falls to an under supplied 3.4. OSV orderbook comprises c.517 vessels, while the non-self-propelled rig order book stands at c.202 units as of end 2013. 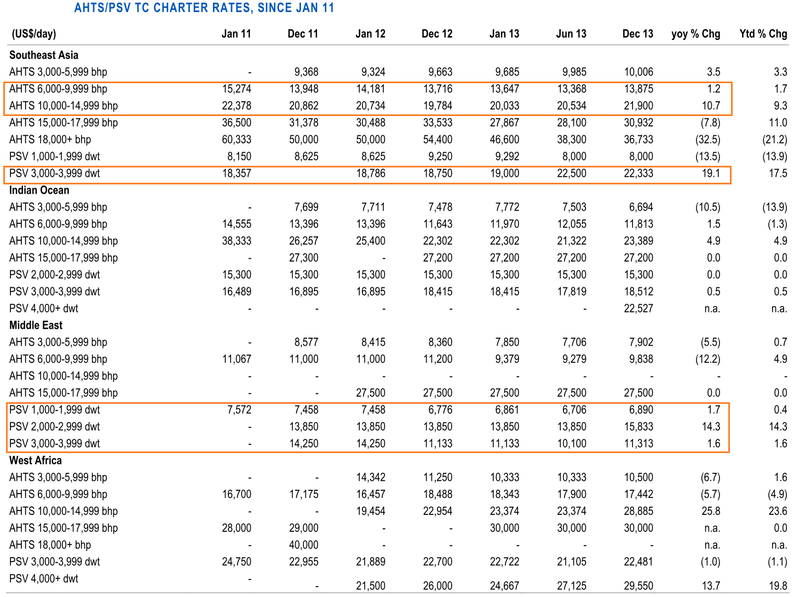 In addition, we believe that Charter rates for OSVs have bottomed since the crisis and are recovering or at least sustaining, particularly in Asia for the small-medium size OSV. The cabotage or local content principle in Malaysia and Indonesia requires vessels operating within the country waters to be domestically owned and carrying the country’s flag. Below is a Table showing SGX listed OSV companies with Indonesian and Malaysian Exposure. The access to protected market satisfying local requirements is critical so that companies are able to grow over the longer term. Nam Cheong significant exposure to Malaysian Market and established relationship with customers position it well to obtain more orders too. Pacific Radiance, ASL Marine, Marco Polo, CH Offshore will also benefit from exposure to these Markets. While POSH has exposure in both Malaysia and Indonesia markets, its income is diversify into International markets, making it less meaningful. Swiber and Ezra are different because they operates in specialized areas of Offshore construction and subsea operations, and able to avoid local content restrictions, due to domestic shortage of such assets and service providers. Ezion is operating in niche areas of Lift Boats in shallow water maintenance of oil and gas platforms. Liftboat market in Southeast Asia is still under-penetrated and has great potential. Mermaid Maritime also operates in specialize areas of tender rigs and subsea business. While higher barrier of entry in this segment implies more opportunities, it may well mean higher cost and more inelastic to changes if market turns grey. As spending percolates through the value chain, offshore construction, installation and subsea activities will pick up and in turn, benefit oilfield services players. Deepwater and harsh environment will become increasingly important and require investments in more complex technologies and equipment. Expect Deepwater capex will grow 130% over 5 years to $260 billion. Natural gas is another long term growth story. Current shipbuilding price is still very much at its trough since the financial crisis. Do not think it will rise any higher in the short run to enable shipbuilders to enjoy a reversal in their thin margins particularly in the low technology end OSV segment. Yard overcapacity issue in China remains unresolved despite the ongoing industry consolidation and restructuring. Companies such as ASL, Otto Marine, having shipyards building OSV for third parties clients should not be optimistic to add profits to their overall bottom line. Expect better profits in ship repairs and ship chartering segments for them. On the other hand, companies with yards building for Internal customers or for their own Vessels usage for docking and repairs, will have lesser burden from their yard capacities. Companies in this categories are Triyards and Marco Polo, Pacific Radiance. Nam Cheong business is unique, profitable but also risky. Nam Cheong anticipates the market trends ahead and build to stock vessels rather than build to order. This allow Nam Cheong to deliver vessels within a shorter time at a premium. To mitigate financial risk, almost all build to stock vessels are subcontracted to China yards with favorable terms. Nam Cheong's own yard in East Malaysia is primarily used for building customized vessels for long time client in Malaysia such as Bumi Armada. Vard is also different as it focused on building high specifications and high value OSV mainly for North Sea and Latin America. While order book is at all time high, it is not my preferred stock due to huge fix overheads from its multiple shipyards even in times of depleting order books. IOC Capex will reduce, but it will not collapse. Long term outlook remains good. Adverse effect of reduced IOC Capex to be offset by replacement of older Rigs. NOC to increase Capex benefiting companies that can satisfy local requirements. Jack Up Rig boom now, short and medium term outlook still good but beware of any twist of fate affecting speculators who are not fundamentally strong. OSV outlook bright due to robust Rigs demand, orderbook-to-fleet ratio declines and improved charter and utilization rates. Specialize market outlook bright due to higher barriers of entry but beware of inelastic business structure if future outlook takes a turn. Does not expect shipbuilding price to rise due to overcapacity problems in China.